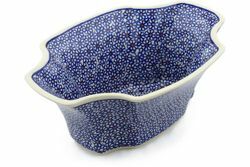 Polish Pottery Salad Bowl. Truly a beautiful piece of Polish Pottery. These stoneware bowls prove their versatility as serving bowls for salads and side dishes–or as lovely centerpieces filled with fruits and vegetables. www.PolishPotteryOnline.com is presented by Admiratrade Company © 2003-2018.